Pictures are made of colors. For this lesson, we are going to say that even black and white are colors. Why? Because they are really the extremes of the range of darkness and lightness for each color. So, for example, inside the deep forest we will see deep greens that go to almost black, and we will see bright green moss or leaves with moisture that are closer to white. The same is true of brick red and pink cherry ice cream or the deep blue suit of the executive and the light blue scarf that she is wearing. 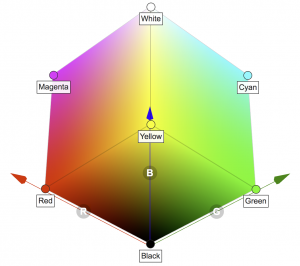 Click on the link for this very interesting site and article on color. Wigglepixel “What are Color Models?” explains colors with interactive tools. Don’t just buzz through this site one time. Even though the explanation tries to be simple, each paragraph is filled with information that has a lot of important connections that may not be obvious. Nuance everywhere~! Watch it once, then play around with the graphics to get used to them. Then later, go back again later and concentrate on just one of the sections. Translate Mystery to Knowledge until you can work with it without thinking it through each time. See if this is something to share with friends. Fun Science. When we see a picture on the screen, we are actually seeing 24 separate pictures every second…or 25 pictures per second in Europe and other parts of the world. And since we are seeing digital cinema from digital projectors, we are actually seeing digital pictures. What the heck does that mean, digital pictures? If we go a few steps back in the chain before the pictures hit the screen, we can see that the picture went through a piece of glass – called the port glass – and then we see it coming out of a lens. Very expensive that lens, but film projectors used lenses and port glass too. So that isn’t what makes them digital. What makes them digital is just before that. 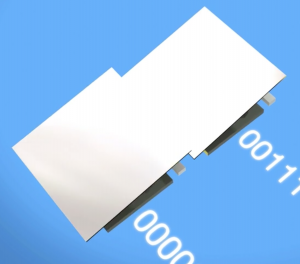 There are 3 electronic chips made of thousands and thousands of very tiny mirrors that respond to the information coming from the media player. The media player is really just a computer playing a huge file. In a way, it is like a Blu Ray player, which is also a computer, but which is designed to play the files from a Blu Ray Disc. The cinema player plays a file from several hard disks at the same time. The information from the hard disks goes to the projector. The projector focuses a ton of light onto some magic chips. Most companies use chips with mirrors, which is what we’ll describe next. Imagine being able to reflect light with some mirrors. 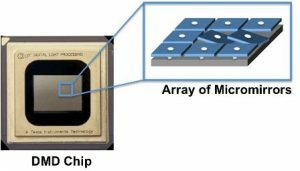 Now, imagine those mirrors are so tiny that you can fit millions of them into one small computer chip. Now imagine that you can control them so fast that they move to the angle you want them to move to a hundred times a second. Now, imagine one chip is being flooded with red light, one chip with blue light, and one chip with green light, and those millions of mirrors are crazily pointing little dots of red and blue and green light to the lens, or away from the lens. Now, imagine that they are so coordinated that the colors combine to make faces and fountains and butterflies appear on the screen. 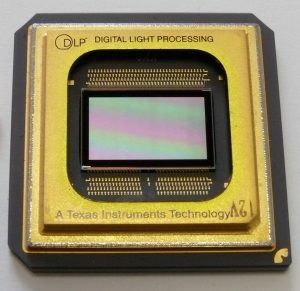 The projectors in your room, Barco, Christie and NEC, all use Texas Instruments DLP (Digital Light Projection) DMDs (Digital Micromirror Devices). Sony projectors use a slightly different kind of magic that does something similar with crystals. And that is what makes it a digital device. The pictures in the computer file are made of computer code that are made of ones and zeros…a one makes the mirror go one direction (to point light through the lens), and the zero makes the mirror point to a giant hole of magic blackness where tiny little creatures watch the same movie we see, only seeing the opposite. Meanwhile, back on the screen. We know that red light and green light will create yellow light. A little less green (or more red) and we see brown then orange, and a little more green (or less red) and we see lighter then more intense shades of green. Different combinations of red and green and blue give us a very wide range of colors to see. In fact, there are billions of combinations that make billions of colors. If we combine all three colors equally with all the energy we can deliver, the colors join to make white. Make the energy less intense but keeping the amounts of red and green and blue equal, and we get a shade of grey. As the energy gets less, the greys go down to black. If we slightly change the proportion of red and green and blue, that grey color will shift. We will be able to see a pink or yellow or greenish ‘cast’ in the grey. But this is where the eyes and nerves and brain and memory get involved with seeing a picture. Because we know what a blue sky is, what red signs should be, what white and green should be. And when we see a bright white cloud appearing on the screen we can be pretty certain that this a very very bright white! Except it isn’t. The brightest white that we see in the cinema theater is hundreds, and even thousands of times less bright than what we see outside when we see a blue sky and a bright pool bathed in sunlight. Our human visual system tries to make things better for us. Which is sometimes a good thing. Because if the system didn’t do that, we would not think that the bright white in a cinema theater was very interesting…but we do. Yet, more magic. And that is the background for Part Two of A Look at Light.